Avast! 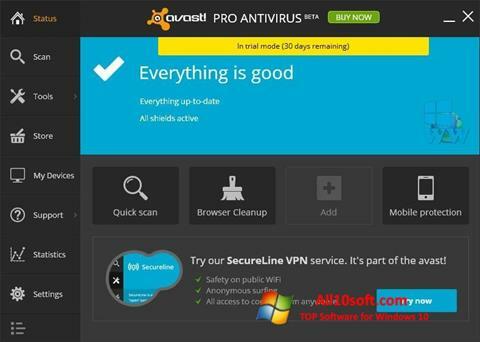 Pro Antivirus for Windows 10 - universal software developed by AVAST Software. The main purpose of the utility is to ensure the safe operation of your computer. The software finds and destroys all possible virus threats. Anti-Virus will not allow intercepting the user's DNS and redirecting it to a fraudulent site. The program supports a safe environment to run and test infected files in it. The user can make financial transactions in a secure browser SafeZone. This is a great set of tools that protects your PC and optimizes its performance. You can free download Avast! Pro Antivirus official latest version for Windows 10 in English.